Buy 2 & save 30%! 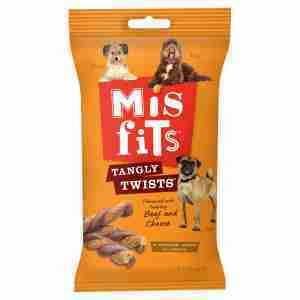 Misfits Tangly Twists are a chewy twisted treat sticks for dogs deliciously flavoured with beef and cheese. The sticks are ideal for a snack in between meals and give your dog a good chew. They support dental hygiene and help keep your dogs teeth clean. Untangled und broken into small pieces they are ideal for training and reward purposes. There are 7 sticks per bag. Large dogs: up to 12 treats per week. Reduce main meal accordingly. Always ensure that there is clean, fresh water available. Good value compared to supermarkets and pet stores... My two love these! My two dogs love miss fits treats they have one each after their morning walk. My dogs Alfie and Ben love these swists after their morning walk. Just wish there was an equal amount in packet. Tangly Twist loved by all. I have 4 Yorkshire Terriers and find it hard to find a treat they all love. I tried these which have 7 in a pack and they all love them. They all wait for their turn to get one.Then run off so no one else can get theirs. Enjoyable dog snack although largely over-priced in shops and online at full price of £1.20 for about 4 twists. They disappear very very quickly with our whippet. Not very cost-effective frankly.